Firefighters continued Friday night to battle a 150-hectare blaze burning just outside the northeast edge of Algonquin Park, between the park and Canadian Forces Base Petawawa. On Friday afternoon, the Ministry of Natural Resources said the fire was spreading at a rate of about five metres per minute. The fire is burning close to Barron Canyon Road in a military training area that covers about 340 square kilometres. It was first spotted on the base at about 2 p.m. Thursday. Military firefighters from the base are battling the blaze with the aid of provincial firefighters from Ontario and Quebec. Several water bombers have been used to contain the fire, which so far has not spread beyond the perimeter of the training area, according to CFB Petawawa public affairs officer Sally-Ann Cyr. No injuries or property damage have yet been reported. Cyr would not confirm if there was a military exercise underway when the fire was spotted. Exercises were taking place, but not in the area that the fire was detected, Cyr said. The training area includes a firing range. The base's fire station is equipped with three tankers and anywhere from seven to 13 firefighters, said Cyr. She said all available fire crews were being deployed. The fire has spread close to the eastern edge of Algonquin Park and a handful of campers at the McManus Lake campsite along the Petawawa River were asked to leave Friday. 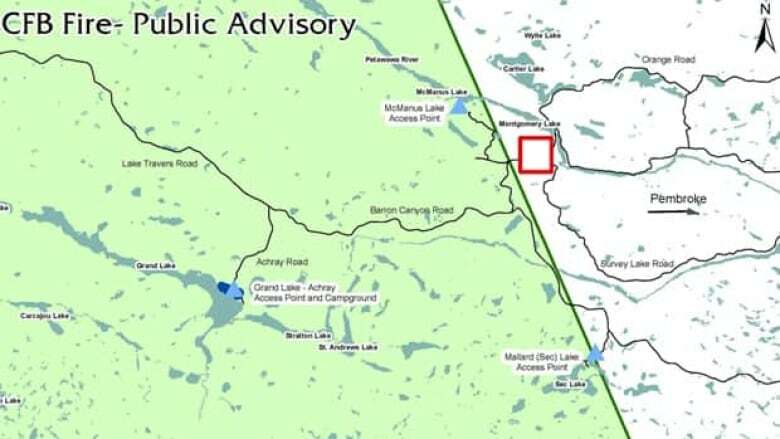 Barron Canyon Road out of Algonquin Park is closed as a precaution and other campers in and around the park's Achray campground are on evacuation alert. Officials were still trying to determine Friday night whether an evacuation of the Achray site was necessary. Campers were being told to stay at their sites so camp wardens can find them quickly if the area needs to be evacuated, should the fire jump the Petawawa River. On Thursday, the park had issued an open fire ban for campers as a precaution, because dry conditions in the region had made the area susceptible to brush fires.